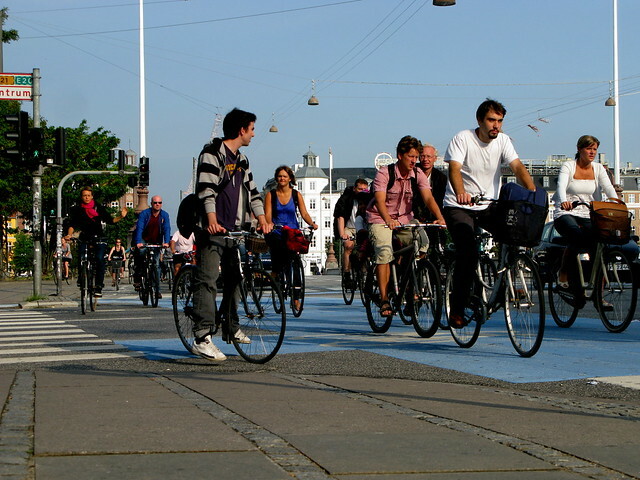 The City of Copenhagen established the first Green Wave for cyclists back in 2007 on Nørrebrogade and, since then, the concept has spread to other major arteries in the city. The idea is simple. Coordinate the traffic lights for cyclists so that if they ride at a speed of 20 km/h, they will hit green lights all the way into the city in the morning rush hour. The wave is reversed in the afternoon so bicycle users can flow smoothly home, too. 20 km/h was decided upon as the speed in order to improve the traffic flow of bicycles. 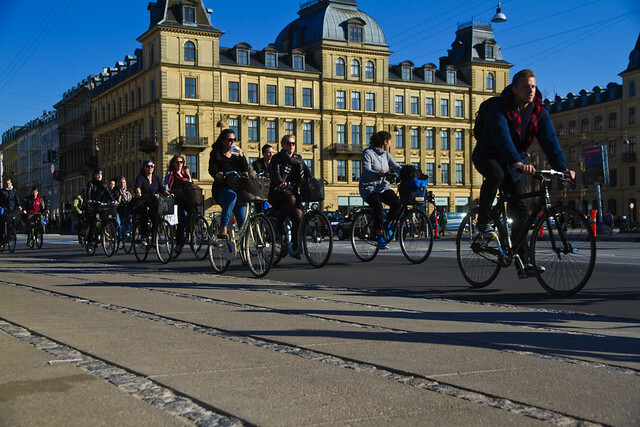 The average speed of bicycle users in Copenhagen is about 16 km/h. A wave of 20 km/h encourges some to go a bit faster but it also encourages the faster cyclists to slow down in order to benefit from the green lights. 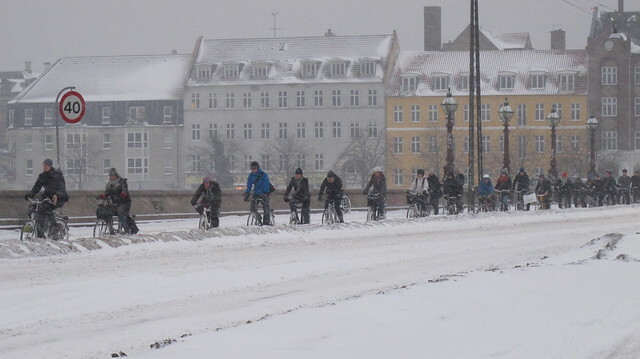 The rush hour on the cycle tracks is intense in Copenhagen and speed demons do more harm than good regarding safety and, almost more importantly, perception of safety. 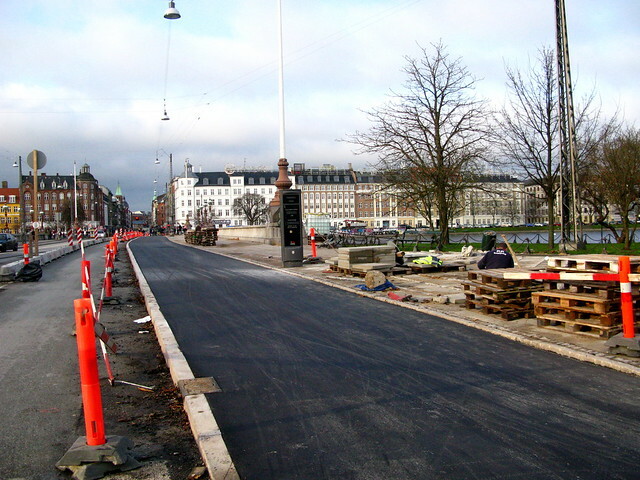 As it is now, the Green Wave is in place on Nørrebrogade, Amagerbrogade, parts of Østerbrogade and along Farimagsgade. 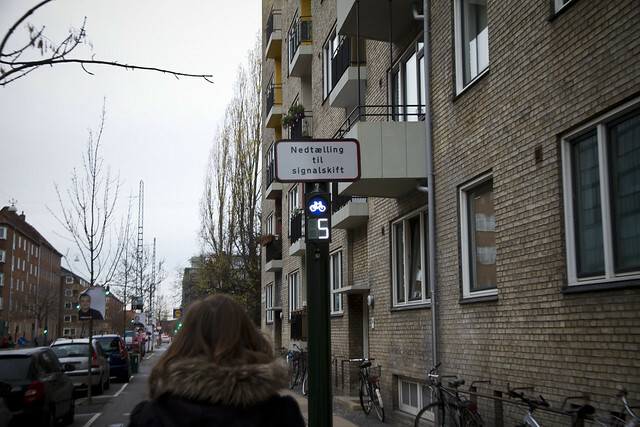 The City is currently testing a pilot project involving a detection system on Østerbrogade. Green Wave 2.0. It will detect bicycle users approaching an intersection. If there are five or more cycling citizens roughly cycling together, the light will stay green up ahead until they pass. Given the mainstream nature of cycling in Copenhagen, you rarely see cycling computers on bikes. Nor do people have any idea of how far they ride or how fast they go. Most people know how long it takes to get from their A to their B. You don't need an on board tech solution to hit the Green Wave. If you cycle the same route everyday, you quickly learn the rhythm of the lights and, regarding the Green Wave, you learn intuitively how fast you should be going. In the rush hour there is the added benefit of herd psychology. A whole bunch of people are heading in the same direction and the speed needed to hit the green lights is seemingly communicated subliminally. There are, however, some interesting solutions for guiding bicycle users along certain stretches of the Green Wave. As a rule they are along longer stretches without intersections. On these stretches, the herd spreads out based on the varying speeds of the individuals. It's easy to lose the sense of the necessary 20 km/h required to keep surfing the wave. Clarence from Streetfilms was in town recently and he made this film of the recent innovations on Copenhagen's bicycle landscape. In it you can see a clip about the LED lights used to help nudge users to hit the light up ahead. Journey Around Copenhagen's Latest Bicycle Innovations! from STREETFILMS on Vimeo. 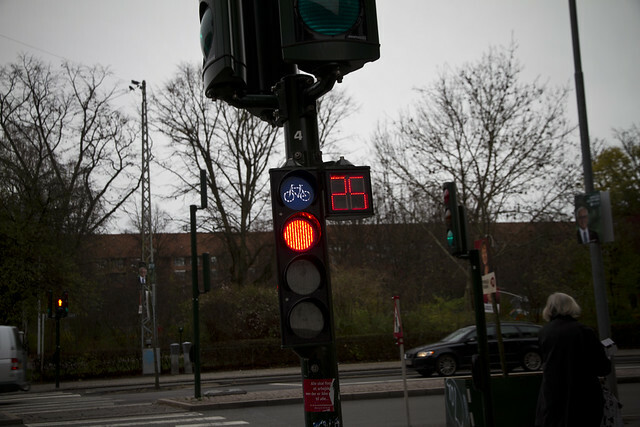 In the Frederiksberg, these countdown signals are in place along sections of the Bicycle Superhighway. While there is no Green Wave present, they serve the same function. They count down to every light change. If the light is red, it is counting down to green and vice versa. Meaning you can speed up a bit or apply your foot brake a bit in order to maintain your flow. While easily 90% of bikes in Copenhagen have foot or coaster brakes, people with sporty hand brakes can obviously do the same. There are also a few digital radar signs on longer stretches. For cars they tend to be warnings of speeding but on the cycle tracks they are friendly reminders about the 20 km/h Green Wave flow. This is unrelated to the Green Wave but bear with us. It is a simple countdown at traffic lights to help curb bicycle user impatience by letting them see how long it will be until the light changes. 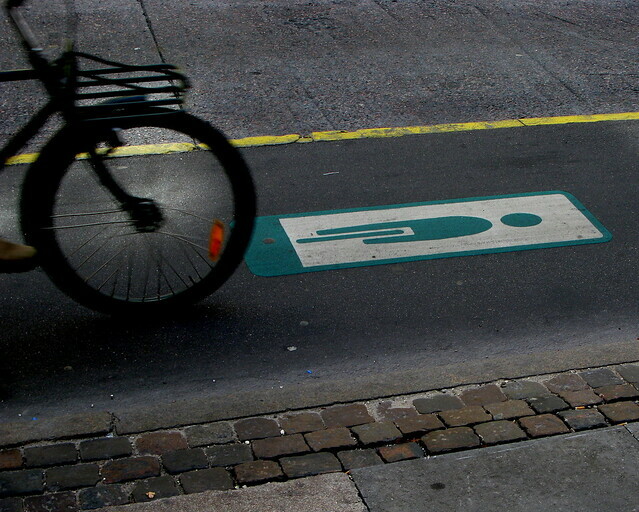 The Green Wave also has its own signage on the cycle tracks and on signs. Copenhagenize Design Co. made this episode about the Green Wave in our series of Top Ten Design Elements that make Copenhagen a Bicycle Friendly City. In this film we made back in 2009 you can see what it's like to surf the Green Wave at 08:15 in the morning. The Green Wave is only in place on major arteries where volume and flow is important so not everyone gets a piece of it. About 80,000 people will ride it each day in Copenhagen, which is roughly 26% of the bicycle users entering the city centre. Nevertheless, it is important, visionary and contributes to the re-creation of a truly liveable city where pedestrians, bicycle users and public transport users are prioritised. You can bang on about the tech aspects of these solutions but at the core lies Plato: "Necessity is the Mother of Invention". Tech solutions are only useful if they actually make sense and serve a purpose. The Green Wave does exactly that. And while there may be days where 20 km/h in the morning rush hour may be optimistic, like above, the herd forms it's own flow in adverse conditions until the cycle tracks are cleared of snow. Which doesn't take very long in Copenhagen. Other improvements go hand in hand with the Green Wave. On Nørrebrogade, with over 35,000 bicycle users a day, there is a need for wider cycle tracks. Above you can see how wide the one way track is across Queen Louise's Bridge. Bicycle traffic has increased by 15% on this stretch since the Green Wave was first implemented. Creating more space for bicycle users is important.